I did a 30 day non-stop yoga challenge. In this post, you can read about my unfiltered thoughts of each day and my overall progress and insights. After two workout sessions the previous day (BJJ at lunch time and strengths & conditioning evening) I woke up with a sore body and a very tired back. So I decided to start my challenge with a 20 minutes yoga class mainly aiming at the back, shoulders and neck muscles. The 20 minutes sequence proved to be the right choice today and had been great already in the past. Another two workouts (well with yoga actually 3) yesterday, I took it a little lighter in general. No workouts today; only yoga. I started my day with an empty stomach and an energising morning sequence of a solid 20 minutes. I did this sequence a few times already and like Yoga with Adriene in general. The yoga session helped me to get my body in motion and work on a few tight spots on my body. Areas at the back of the knees and the calves were very tight. Again two workouts, straight in a row. Both were new ones, adjusting to the fact that I a) had a little more time, which meant the first workout was a little longer than usually (solid 30 minutes) and b) that my upper back, shoulder and neck were very sore and felt tight. So the second yoga workout focussed on those points (20 minutes long). https://www.youtube.com/watch?v=M-pZtKKdUKE ► Sequence was good but rather static at times. When deep breathing was demanded the video advanced too fast, I was breathing too deep thus taking too much time. Helpful nonetheless. https://www.youtube.com/watch?v=Vlo5yzWM7po ► Ample amount of great and very helpful stretches. I got rid of a lot of tension and felt much better after the session. Overall I feel progress already. Another morning yoga workout with Adriene. It was the energising morning sequence, as I felt very tired and was indeed very stiff. Later that day I did an hour of BJJ and some muscle workouts (arms, abs) in the gym. I did the same yoga sequence as on day 1. When I woke up I was very tired and as this sequence helps relaxing back, shoulders and neck and follows a slower and quieter pace, it felt like a good choice. It wasn’t a bad session, but in retrospect something focussing on stretching the back and the back of the legs more would have been better. I went only to my BJJ class at lunchtime and skipped the evening strength and conditioning training at the gym. My body was very tired and I realised that I have to eat more. This time, I opted also for a longer video, 40 minutes long, in order to get my body used to a higher intensity, both in the quality and quantity of the workout. It was a beginner’s routine which proved to be overall slightly too easy for me. Especially the parts requiring muscle strength. Stretching still remains my biggest weakness and needs to be trained more intensely. Today during yoga practice, it also felt as if I’m rediscovering yoga. It was more fun than in the past years and the past few days. I slowly start to enjoy practising yoga. I could already feel it when I had to get up. I got much easier out of bed, looking forward to my yoga session. Beforehand I knew, of course, that it was a beneficial activity, but it felt like a chore which needed to be done. This definitely started to (slowly, but hopefully constantly) change. After yesterday’s three workouts I slept like a groundhog. When I woke up I had trouble getting up and out of my bed. I quickly realised that my upper body, mainly shoulders and neck were very tight. So I decided to re-do one of my new discoveries (the one from day 3). As this yoga sequence is a rather slow and quiet one, it also helped me to gently wake up and get my blood flowing. After those 20 minutes, I felt much better, relaxed and was awake enough to start the day. In total, I did three workouts again. My body is tired, but coping well with all the stress and the forced exhaustion. I barely got out of bed because I was so tired and exhausted from all the stress at work and all my workouts. I felt like staying in bed and skipping yoga altogether. But I still want to complete this challenge. So I got up and did a short 20 minutes yoga session focussing on my back, stretching out all the kinks and getting the blood flowing. As I worked on my back the previous night in the gym, this was difficult but it felt very rewarding afterwards. During all of the day, my back felt tired. Nevertheless, I am certain those initial 20 minutes had a huge impact on my well-being today. I had no BJJ class at noon (for once) and tried to rest during my lunch break. The evening was a long gym routine with 20 minutes jogging, 20 minutes biking and a leg day (the first in months). I started with 10 minutes of jogging to warm up, then my leg exercises followed by another 10 minutes of light jogging and 20 more minutes of biking at medium intensity. After all of that I did several yoga stretches to make sure my hips and legs are not getting too tight afterwards. As I do most of the times when I’m having a strength and conditioning session, I went to the sauna for around 15 minutes. This really helps me to cool down mentally and simply relax. Another day, another workout! Today I started my day with two new workouts, both of them from Yoga With Adriene. The first one was setting the tone for a great and relaxing start and is called Morning Yoga – Yoga to start your Day. The second yoga sequence is out of the Yoga for Weight Loss series and tackled the hips and hamstrings (Yoga For Weight Loss – Hips & Hammies). In total that was a solid 50 minutes of yoga and I felt good afterwards, relaxed and full of energy. The work week was very intense with many sessions at the gym and plenty of BJJ. My body is all bruised up and my joints and muscles are very tired. Considering that on day 8 I had a leg day, my legs feel relatively fine (so far, we’ll see how they’re tomorrow, though). The stretching exercises from day 8 definitely helped and continually (i. e. on a daily basis) stretching my body seems to not only improve flexibility (which is obvious) but also enhance my rate of recovery! Wow, leg day finally hit me hard! When I woke up and tried to move my legs, I had terribly stiff muscles and the dreadfully awaited muscles aches. That being said, I did what I had to do and tackled the elephant in the room and started my day with a yoga session. In order to get my blood in my legs flowing again I chose a new flow, one focusing on lower body, hamstring and leg stretches. Those 30 minutes were gruesome but ultimately helped me a lot. Once the session was over and I managed to relax with a little breakfast and some coffee, my legs and the rest of my body felt much better! The yoga flow was indeed working well and I could intensely feel how my hips and legs got stretched. My back didn’t seem too affected and most stretches were easy for my back. This is the second video of “Yoga TX” I did and even though it was a different teacher, the video was well constructed. I’ll definitely keep it in my repertoire. Later that day, after having had a rather quiet and relaxing Sunday, I felt like doing a more engaging and energetic yoga session. I picked another video from Yoga with Adriene, this time a 40-minute vinyasa sequence for strength. The sequence was definitely working my muscles and incorporated many useful stretches. At times, it was a little too fast for me as I wasn’t familiar enough with several of the asanas we did. Which meant I had to listen and look at the screen to figure out what to do. Nevertheless, it was what I was looking for in my session and what I tried to aim for in general (as said earlier, I want to try out more difficult yoga sessions every now and then). When I woke up this morning I felt exhausted. I didn’t sleep well and not enough, my body felt accordingly. I did a 20 minute Yoga flow to stretch out my body. In the session, there were plenty of stretches, twists and some mindful muscle work. It helped to get me started into the day, but it really wasn’t enough. Nevertheless, this session of Yoga with Adriene was once again very helpful and fun. I learned a few new things and re-discovered my body with every new yoga session. It’s a curiously fun and exciting feeling. I have to put in some work on aligning my movements with my breathing. It’s more often than not out of sync with the exercise and my body. It costs a lot of energy to then push through the exercises, as I am working against myself. During the day, I did a lunchtime BJJ session. Afterwards, my lower back slightly hurt. Not because I injured it, but it was so tired. I still have problems with my left shoulder. I need to relax the frontal muscles in my left shoulder. In the evening, I did another strength and conditioning session. Next to my tired lower back, my legs are still tired. Especially my calves and my psoas major muscles on both sides are tired (I have trouble lifting my legs). My lower back and my legs are still a little sore. I slept like a groundhog again and slightly overslept, which made yoga this morning challenging. Nevertheless, I went for it. I did a 15-minute yoga session focussing on stretching out my lower back issues. It was a new video for me from Yoga TX. It really helped me to make my back feel better again. This evening, after a yoga session, a BJJ training and another gym workout, my back feels actually quite OK. The remaining muscle issue I have is my left shoulder. Everything else is very tired but doing well. Occasionally, when I’m in the sauna after my last workout session, I do several yoga-inspired stretches. The combination of the strong heat (100°C) and the already warm muscles is very beneficial for arm and shoulder stretches and forward bends. But those exercises use a lot of energy in those circumstances and I always have to pace myself and have to make sure to actually use the sauna to cool down – body and head. So, once again I had a mediocre night. I have too many things going on in my head, which makes it hard to shut down, even while sleeping. It took me a while to realise this. I wanted to try a new morning sequence, but there was actually an issue with my flat’s heating system, so I had to invest time into quickly fixing it. Afterwards, I was short on time and went for the Yoga TX video which helps to work on neck, back, and shoulder pain. My neck is alright, my lower back was only tired today and seems to have recovered. My left shoulder, the deltoid muscle in particular, seems to have more serious issues. That’s why I opted for this video. It helps a lot. During the day, I had not further issues whatsoever with my back and my neck is still fully functional. My deltoid muscle seems to be sprained. A quick online research indicates a 1st-degree sprain. I still went to BJJ class, but the limited ROM of my left shoulder is restricting. I skipped my strength and conditioning session, though. I went home earlier and started cooling the muscles while trying to rest the shoulder as much as possible. Let’s see what happens. I want to do much more yoga! Today I did something completely different than before. The days earlier in my challenge I picked sessions I either already knew and liked or that I searched for. This morning I simply took a yoga session Yoga with Adriene aired the previous night. As it fitted time-wise and looked interesting, it was perfect for a change. The video is out of Adriene’s “Foundations of Yoga Series” and was a 20-minute yoga practice to prepare and practice revolved side angle pose (parivrtta parsvakonasana). It was a very interesting and humbling experience. The preparations which ultimately lead to revolved side angle pose were fun and challenging to do. Once we hit the actual pose I was way out of my current yoga skill-set. Nevertheless, I tried to hang in there as best as I could and all things considered didn’t do that bad. Still, there’s a long way to go. I’m looking forward to it. Later that day, I went again to my lunchtime BJJ class and in the evening for a strength and conditioning session where I focussed on my back muscles. I tried to relax my shoulder as much as possible, too. After a long sauna session, with a very enjoyable conversation about martial arts with a random guy, I cooled my shoulder down again. I hope it helps. After yesterday’s hard and gruelling workout session, on which I focussed on my back for the strength and conditioning exercises, my back felt surprisingly well. Therefore, I opted for a general yoga session. The idea was to just get my body moving and into its flow. Adriene from Yoga with Adriene has a cool session to do this. It’s very basic, but that’s one of the key aspects I enjoy. In the session she also makes sure (as in her other videos) to be mindful. Mostly this comes with your breathing, especially when you’re stretching. So the video also incorporates plenty of stretches. I felt great afterwards and I slowly start to grasp the wider idea for proper posture in the basic asanas. There are a few I do quite well already and can focus better on my breathing, thus enhancing the overall benefit of the asana. Later that day I went for yet another lunch time BJJ session. It was a great experience, but I can feel how tired my body is. My shoulder is still not fully OK. But it’s not getting worse either. Finally, I went to the gym in the evening again for some muscle work. Friday is usually leg day – it went well. At the end, I did some runner’s stretches. This was less stress- / painful as expected. I actually felt very loose, flexible and confident. So I went for crow pose. For the first time, I managed to lift off my feet from the ground and flew for 3 seconds. It was a great feeling and a visual sign of my progress of the last few days, weeks and months. Wow, I had an incredibly good night’s sleep. It was one of the best I’ve had in weeks. My body felt accordingly and was very well rested. My legs felt OK and in order to help them recover faster and better, I went for another yoga session focussing on the legs. Still sticking with videos from Yoga with Adriene. She has a really neat and helpful runner’s yoga flow. I managed to get through the 30 minutes session well and I was able to focus on my breathing and on the stretches. Occasionally, I was able to go really deep and release a lot of tension. As I had a very intense week of workouts behind me, with an overall of 13 workouts in 5 days, I only did this one session and gave my body the chance to recover; especially my left shoulder. The shoulder still isn’t getting better. Nevertheless, I’m doing my best to rest it. Tanja (my beloved editor in chief) kinesio-taped it for me and I’m treating it with white (cooling) tiger balm. The last few hours of the day I’ve been enhancing the cooling effect with cooling packs. Yesterday was a good day, the trimming down of my exercise time for some time and the fact that I went out to do some shopping for things I needed and nice talks, drinks and an indulgent dinner in the evening really made my day. I had another good night’s sleep and woke up well rested. My body had a real chance to recover (good sleep and proper nutrition are key for recovery!). It’s two days after leg day and my legs feel well and not really sore – surprisingly no muscles aches. The stretching, sauna sessions and of course yoga flows helped a lot as I was pushing hard on leg day. Even my left shoulder is getting better! So today I started with a 25-minute yoga session for an energising start into my day. The beginning was slow and calm, helping my body to slowly wake up and the blood flowing and your body fueled with oxygen. There were very helpful asanas, stretching out my legs and my hips. I’m looking forward to doing this workout again and seeing my progress. As I was now wide awake and feeling well and energetic, I tried out a new workout with Adrien. It was working on strength and focus. This was a very hard and challenging workout session. At times I had to simplify a few asanas in order to cope with the workout. The session was not only strengthening legs and core but also working on breathing. This was especially difficult, as I still had to focus on the different poses. It’s unbelievable how intense an asana can become if you forget to breathe or breathe wrongly. Lot’s of work to do, but the session was fun. Sunday morning yoga is great and it’s the time of the week when I look forward most to my session. It’s a combination of Sunday being a day on which I wind down, chill, relax and just be. No obligations, no drama. Just. SUN-day. There’s not much sun out there at the moment, but the yoga practice, with lifting up your heart, deep breathing and maybe some sun salutations has become more to me than just a flow of motions. There’s still a long way to go but I start to enjoy the path a lot lately. A new week arises! Of course, this means more yoga fun and excitement. The weekend was used wisely and my body recovered a lot. With the relaxation and the increase in food and the decrease in workouts, I managed to gain some weight. As I have to make weight for a tournament in 12 days this means that my weight cut will start now. Therefore, I’ll change the focus on my workouts, less strength and much more conditioning are on the agenda. Of course plenty of BJJ and many yoga practices for strength and flexibility. I opted for a yoga workout from Adriene. This one I did in the past already plenty of time and it has been a moment since I did it the last time. I always enjoy how Adriene structures her sequences and you’ll definitely know what you are in for judging from her video titles. This sequence proved to be very challenging today. It’s always an interesting thing to see how the same thing affects your body on different moments in time so differently. Today forward folds and downward facing dogs were relatively “easy”. I feel and see the progress a lot. On the other hand, the high lunges in the workout were today extremely challenging just to maintain properly. Any further movements were almost impossible. High lunges are one of the asanas I like and enjoy a lot and right from the beginning could do rather well. Yoga is a very humbling thing and it teaches you not only to breath but to practice patience and to love yourself. I like that a lot about yoga practice. It keeps me grounded and rooted. I went for a new yoga sequence from Yoga TX that I had on my watch list for a while and was looking forward to. After finishing yesterday evening with 45 minutes of cycling I thought it wise to work on my flexibility and stretch out my back and my legs this morning. The workout was around 30 minutes long with plenty of small tweaks and insights concerning proper stretching. Overall the different poses weren’t too hard, but well-structured and overall it was a very engaging workout. Considering that I was shortening my leg muscles yesterday my flexibility was OK. Nevertheless, I had plenty of tight spots, including the neck! I am often impressed how much progress I made in such a short amount of time. It shows how important proper and continuous yoga workouts are. I feel really well, especially as I sleep only around 6 hours a night and workout up to 3 times a day. One of the most immobile and difficult stretches are seated forward folds. If I flex my feet and have straight legs I basically sit there with a 90° angle (body/legs). Today I even saw some progress, if very little, in this position. I wonder what my personal challenge will bring next! I had one of those nights where I slept like a groundhog again and woke up very tired. Today was really a day on which I would have preferred to stay in bed and just sleep. Then wake up and sleep more. But I didn’t and I rolled out my mat and started my day with some yoga. Lately, all my yoga sessions have been rather short, at least during the work week. Today is no different. I did a full body stretch session which worked on my flexibility while getting stronger. The flow was by Cole from Yoga TX. The 15 minutes worked like a kick start on my body. Afterwards I was wide awake and ready for breakfast. The session was good and it was rather impressive to see what you can do in 15 minutes. I was rather unstable on my feet and in the asanas. As my left shoulder starts to heal up, many movements become easier or better: less restricting. It’s a good feeling to get your full range of motion back, if only very slowly. The pain from moving my deltoid too much has declined and becomes less frequent. The kinesio tape I was wearing to stabilise my deltoid helped a lot. I removed it yesterday, though. I needed to give my skin some time to breathe. Speaking of breath: it’s not much different during yoga practice, but I breathe much better during the day. The biggest impact of my better breathing still shows during BJJ practice. I’m much calmer and not as easily out of breath during extreme situations, such as chokes. It’s been already 3 weeks into the challenge. At the beginning, it was a little challenging but remember: it’s called “challenge” for a reason. Today I woke up OK-ish, being still slightly tired from yesterday (yoga, BJJ, and cardio). Nevertheless, I got out of bed fast and easy enough to tackle a 30-minute flow. I did it a few days ago, from Yoga TX’s own Cole. It was a full body yoga flow with plenty of stretches. Last time I did the workout I couldn’t do all the postures properly as my shoulder was not only limited in ROM but ultimately still hurting a little. As my shoulder barely hurts and my ROM has increased (but is far from where it should be, though! ), I wanted to retry. The session was very good, getting my body moving. My shoulder was holding up and even after doing cardio the previous evening my legs were rather stretchable. I couldn’t help but smile and feel good about my session, my progress and the challenge. I tried to actively work on self-love, something I am struggling with. Now as spring advances, the sun is slowly but steadily rising earlier. I love rising with the sun. I feel so energetic, happier and more positive if I do. Right after I was done with my yoga session the sun really started to rise and I had a great view while eating my breakfast and drinking my coffee. Waking up well rested and relaxed has its perks. One being to get out of bed easier. And that’s what I did today and got ready for a new workout! Today I did some Yoga with Tim, which was a first and it was different. Why? First of all, it was the first session on Youtube I did that was led by a man. That gave the whole atmosphere and flow a different twist. And with different I mean different, not better, not worse, simply different. The second thing which was different was that it was a less instructional video and rather a video where Tim guided you through the flow. This made sense as it was a fairly advanced workout. I managed to get through the asanas, but as the level was higher than I am used to, it was difficult at times. I saw and felt it mainly in my breath, which was at times not existent. I like doing workouts which are a little too hard. Makes me humble, showing how much of the road is still ahead of me. But it also teaches me that yoga is not a means to an end but a companion. You are together at a certain point in time, like in any other relationship and then you try to make your best out of the situation. The flow was really making my muscles work and focussed less on stretches. Nevertheless, at the end the flows slowed down and became less intense and we started to stretch out. This helped to prepare for the final relaxation. Unlike the last weekends, I didn’t start with a lot of yoga into my day. I felt tired and exhausted and my body needed resting. In order to still get my body in motion and stretching out the kinks I’ve got all over my body, I went for a 15 minutes sun salutation flow session with Tim. The duration was perfect for how I felt. I was just long enough to really warm up my body, working my core muscles, stretching the body and short enough to not exhaust myself even further. The video was good, but still very different to how women display and guide through their videos. He gave a few insights about sun salutations in general and I realised I need to work on my rhythm, meaning that I need not only to get stronger and more flexible but more importantly syncing my movements with my breath and my breath with my movements. Not a good night’s sleep, could have been the amount of food I had the previous night or just bad sleep because I was too tired. Who knows, either way, I woke up early and decided not to go back to bed and make the most out of the day. So I started with what Adriene calls love yoga flow. Considering how bad the night was and how tired my body still was the previous day, I felt rather well and very aware and energetic during the session. The yoga flow was a total of 35 minutes of vinyasa practice during which a lot of stretching and strengthening took place. I did very well and I felt strong and confident in the different asanas. Every now and then I had a roundish back while transitioning, but it was better than a few weeks ago. I could stretch really well and could sync breath, body and movements well. The flow was tiring but still a very kind and loving yoga session. It was really fun and I felt happy from within. I had a very good night’s sleep and managed to get out of bed early and felt like doing a little more morning yoga than usual. With the exception of a tired right knee, which I injured two years back, I really felt good. My deltoid muscle keeps relaxing but is still a little stiff. My range of motion still improves, though. The yoga session was 40 minutes long and hosted by Adriene. I did this one already in the past, i.e. before the challenge, and it was fun to do it again. The workout was from the Yoga For Weight Loss series Adriene created and was all about strengthening and lengthening the body. The flow begins slow and steadily increases both in speed (but it’s never fast) and intensity. 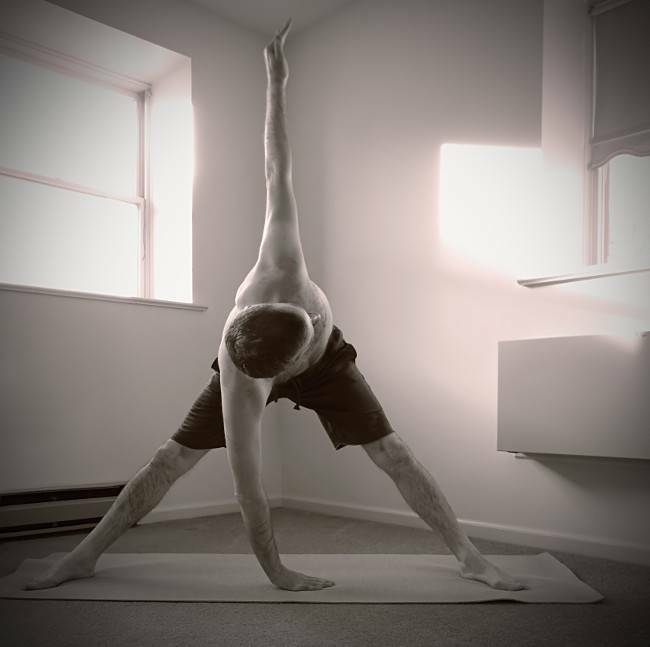 The build-up to the harder asanas is great and you have really are given enough time to warm up. I enjoyed the combination of strength and twists in the flow; especially the high lunges and the warrior poses are things I like a lot. My body keeps getting more flexible and even forward bends begin to become enjoyable. This is due to the fact that a) my body slowly adjusted to yoga workouts and started to lengthen and b) I have much better form while doing asanas. I used to think that when you do bends and stretches (like forward folds or upward facing dog) it is imperative that everything needs to be straight and locked in properly. Now I know how wrong I was and since that small realisation huge progress was made. The benefits of stretching and twisting my body daily are enormous and my everyday posture has improved a lot. I keep much straighter at all times. In many cases, I manage without trying to have a have a straight back and a straight spine with a long and straight neck. This relieved me of a lot of pressure and tension. Now the self-imposed yoga challenge is almost over, only 5 more days left. It feels weird, yet it was exciting! Yesterday during BJJ practice I hurt my left shoulder. It kind of popped. Twice. I didn’t have any pain when it happened but my shoulder felt very tired afterwards. During the day it was fine, but when I went to my strength and conditioning training my shoulder started to hurt a lot. I skipped the training, only did a few minutes of sauna and headed home. I slept well, which probably was due to the fact that the day was stressful and intensive and that my shoulder really knocked me out! When I got up my shoulder felt surprisingly healthy and recovered. And in part that is true, the recovery process was good. Nevertheless, I didn’t want to put the shoulder under more stress and for today I did a back yoga session from Yoga Vidya. I did it plenty of times before and know it well. In the 20 minute session not much shoulder work is needed (mainly an incline plank to strengthen your back). Those asanas have been replaced by gentle standing forward folds. Besides that the body felt well and fine. One benefit of re-doing the same yoga workflow over and over again is that you can start focusing on the details and declutter your mind from the distractions (like checking the screen to figure out what’s going on). My shoulder is still in full recovery mode and I am trying to rest it as good and as much as I can. I failed to get an appointment for a massage, but I’ll have an acupuncture session tomorrow. The most problematic part is that the shoulder is inflamed and that the muscles and ligaments are very irritated. I take medication fighting the inflammation and have kinesio-taped the shoulder to support it further. When I can I use a cream to enhance recovery and cool it when possible. Range of motion is doing OK and not working out helped obviously a lot. Nevertheless, I am going to finish my challenge. Today’s yoga session was short, focusing on hip opening vinyasa. The amount of shoulder work needed was a little higher than expected but luckily not very intense and as the workout was only 15 minutes long it was manageable for the joints but resting completely would probably have been better. That being said I liked the quick hip opening flow. I will use parts of it as my post-workout stretch for my strength and conditioning and BJJ workouts. Especially as my hips need to be as loose and flexible as possible. It enhances my BJJ skills a lot. The shoulder still isn’t good but recovery is definitely happening. Normal movements are more than possible, but still my deltoid is tight and thus limiting the range of motion of my shoulder. In retrospective, I think this limited ROM is the reason why my shoulder popped twice in the first place. Every now and then I feel some slight but unfortunately sharp pain on the deltoid exactly where the shoulder joint is located. I did only a short 10-minute session of yoga, mainly doing my own things. A little cat-cow, standing and seated forward bends and a few spinal twists. All of it was very calm and I tried to let go and focus on my body. I am somewhat disappointed that I couldn’t do more yoga the past several days. The fact is, I really started to enjoy it and the progress I saw and felt triggered something deep within me. I felt more connected to something, but I am not sure what. It would be great to say that it’s myself, the here and now, the world or the universe. But that’s not it, not yet at least. After my visit at my naturopathic healer and TCM practitioner last evening, my shoulder felt instantly much better. She did a few special exercises with my shoulder which immediately improved my shoulder’s ROM. Afterwards, I warmed my shoulder up with a hot shower at home and enhanced the warming up process with the use of several moxa plasters on the relevant muscles. This helped to relax the muscles even further overnight. In order to fight the existing shoulder inflammation, I keep resting the shoulder and using appropriate medication. This morning I did another yoga session, focusing again on the back. I hope the shoulder keeps getting much better quickly! Last day of the challenge! It’s weird and incredible that it’s already over, yet it was a lot of fun and definitely an experience I wouldn’t like to miss. My shoulder’s health increased tremendously and ROM and the “feel” of the shoulder were very good. I already know how greatly adequate treatment can impact your health, but it still was mind blowing. As my final workout I did an energising morning yoga session with Adriene, the one I’ve been doing plenty of times. It went well, but I could feel how I was rather stiff and I tired faster than expected. During the last 30 days I improved a lot and I really learned a lot; about yoga, good general posture, my mind & body, breath and also simply myself! I am looking forward to continuing my yoga journey. There’s much to learn and it’s exciting. This entry was posted in Lifestyle, meditation, yoga and tagged challenge, diary, men, yoga by Stefan. Bookmark the permalink.